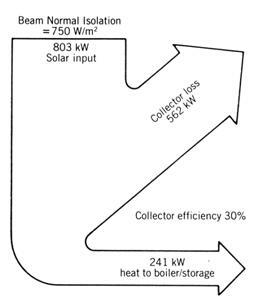 This legacy article on ‘Solar Energy System and Design’ by W.B. Stine and R.W. Harrigan (published in 1985 already) has four Sankey diagrams for energy flows in a solar power system. The old-school black&white Sankey diagrams depicted have a general vertical orientation, and some flows branch out to the left of the general flow direction. This is OK, but the first branch flow bends with an angle larger than 90° degrees, performing an almost U-turn. In the next diagram this idea is doomed to fail as the Sankey arrow to the left is wider than the one going straight on, and the initial parallel segment is much too short. 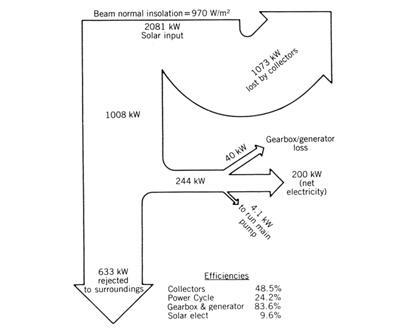 Additionally in this second Sankey diagram the two arrows at the bottom don’t add up with their flow quantities correctly (633 kW + 244 kW is not 1008 kW).